Helensburgh,G84 8NP, Argyll & Bute, Scotland. 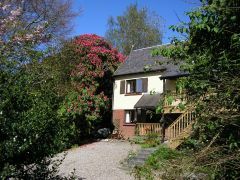 4 Star self-catering accommodation adjoining attractive home in large garden, with lovely views across the Gareloch to the hills beyond. 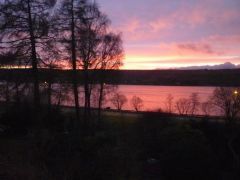 Close to Loch Lomond and Helensburgh. Forty minutes to Glasgow Airport. Perfect for couples. Fully equipped, open-plan kitchen/living-room downstairs, and a double-bedded room with adjoining bathroom upstairs. Argyll and Bute is arguably Scotland’s most scenic county with excellent road and rail links to the rest of the country. 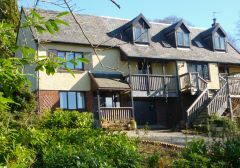 Garemount Lodge is an ideal base for exploring – we’re on the Clyde Sea Lochs Trail, a mile from the Conservation village of Rhu (friendly pub, 2 hotels, shop, sailing club, marina with cafe), and half a mile from the Clyde Submarine Base at Faslane. The Victorian waterside town of Helensburgh is four miles away and has two railway stations (to Glasgow and to Edinburgh, or north on the picturesque West Highland Line), and boasts 3 supermarkets (Waitrose, Co-op and Tesco), plus many independent shops selling a wide variety of goods. There’s Charles Rennie Mackintosh’s masterpiece The Hill House, restaurants, golf, tennis, bowling, putting, a swimming pool, fitness centre, and a variety of pleasant walks. The Waverley, Britain’s last ocean-going paddle-steamer, sails from Helensburgh to the Kyles of Bute during the summer. The Loch Lomond National Park with its visitor centre, shops, sea-life centre, and tourism attractions is nearby. Glasgow, one of Europe’s top-destination cities, is 26 miles away. It's a great city for retail therapy, plus museums, art galleries, restaurants, theatres, and impressive Victorian architecture. Glasgow Airport is 20 miles away whilst Edinburgh is under two hours' drive. Less than an hour away, are the Trossachs (Rob Roy country) , Stirling Castle, the William Wallace Monument, Blair Drummond Wild-Life Park, and Inveraray Castle (home of the Duke of Argyll). 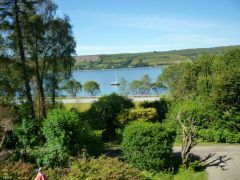 There’s sailing or paddle-boarding on the Gareloch, and Shandon Country Pursuits, a short walk away, offers horse-trekking, clay-pigeon shooting, off-roading, fishing, or archery. From your windows, you might see deer in our garden, sailing boats on the Gareloch, or even a submarine enroute to the Clyde Submarine Base, half a mile away.